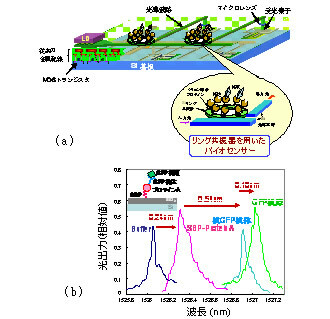 Research of on-chip optical interconnection which overcome the performance limit of metal interconnection and optical biosensor utilizing optical resonator and integrated circuit technology. Developed Si photonics technologies are applied to fabricate integrated biosensors which detect biomaterials such as virus and allergen. Structure of the proposed biosensor is shown in Fig. 2, which enables high-speed simultaneous detection of plural kinds of biomaterials at home. 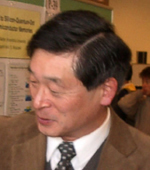 Conventionally enzyme-linked immunosorbent assay (ELISA) has been used for the detection of the biomaterials. However, it is only available at the hospital. Our biosensor utilizes Si binding protein (SBP) which is fixed at the sensor surface and the antibody can be attached to the SBP in the aligned direction. Then the selective antibody -antigen reaction is detected from the change in the resonance wavelength of the Si resonator. By integration of different kind of antibody in the same chip, the plural kinds of antigens can be detected simultaneously. Figure 3 (b) shows an example of detection of green fluorescent protein (GFP) antigen-antibody reaction. Now we are trying to increase the sensitivity of the sensor to the practical level. 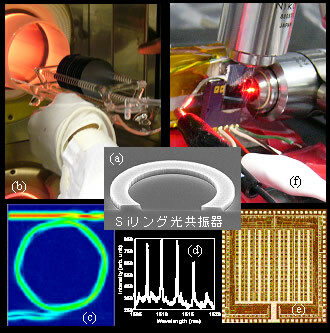 Fig.1 Research topics: (a) Si ring optical resonator, (b) Fabrication technology (oxidation process), (c) Simulation of optical resonance, (d) Example of optical resonation characteristics of the ring resonator, (e) Fabricated optically interconnected chip (256 bit 3Dmemory), (f) Apparatus for optical measurement. Fig.2 (a) Structure of target LSI with on-chip optical interconnection. (b)Example of characteristics of Si ring optical switch. Fig.3 (a) Structure of Si microring biosensor which enables high-speed and simultaneous detection of plural kinds of biomaterials and (b) example of detection of green fluorescent protein (GFP) antigen-antibody reaction.